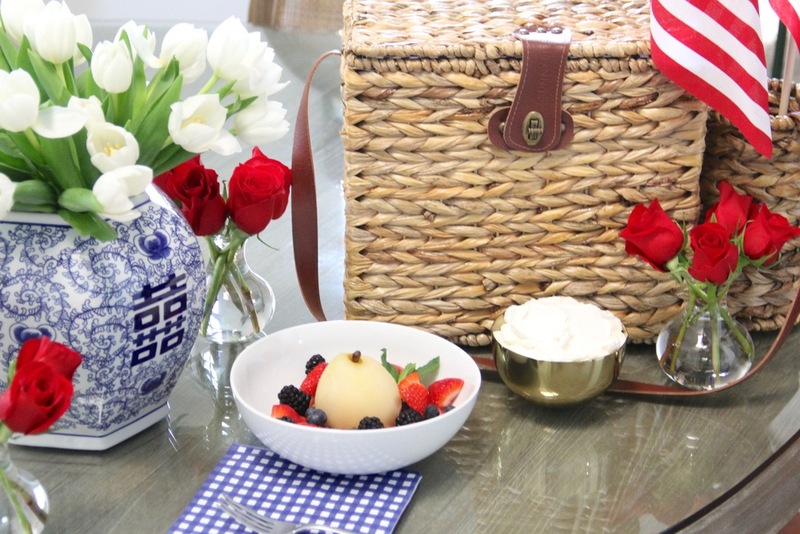 Fourth of July is without a doubt one of my favorite holidays for picnicking. Warmer weather, a long holiday weekend and enjoying a spectacular fireworks show on the national mall are just a few of the many reasons why I find picnicking to be an absolute must! When trying to come up with a delicious menu that suits the time of year and is easy to transport, the one go-to that always makes the cut is my summer poached pear recipe. My summer poached pear recipe is a fabulous addition to any picnic and/or summer meal. It's easy to create, has a wonderful flavor profile and serving it cold makes for an absolutely refreshing and delicious conclusion to any summer meal. Here is how I went about creating this recipe. In a medium sized dutch oven, combine the juice of a lemon, bottle of wine, sugar, vanilla bean, lemon peel, water and anise. When the liquid in the dutch oven reaches a boil, gently place the pears in the boiling liquid, cover and allow contents to boil for 25 minutes. *Note- When the pear is cooked, you should be able to pierce through the pear without any resistance. When pears are finished cooking, gently remove them from the boiling liquid and set aside on a plate to cool. Continue cooking the liquid for another 45 minutes (roughly) until the liquid reduces down into a syrup that can coat the back of a spoon. Serve pears with a mix of seasonal fresh berries, a dollop of whipped cream, sprig of fresh mint and drizzle of the poaching syrup. Nothing beats the taste of fresh summer produce! Literally this is probably what I look forward to most with the start of the summer season. Whether your enjoying the delicious array of berries that are now in season or the abundance of fresh herbs like basil, summer is the best time of year for enjoying all things fresh and colorful. In an effort to come up with a recipe that best celebrates the array of delicious summer flavors, I spent some time researching recipes in hopes of finding inspiration. 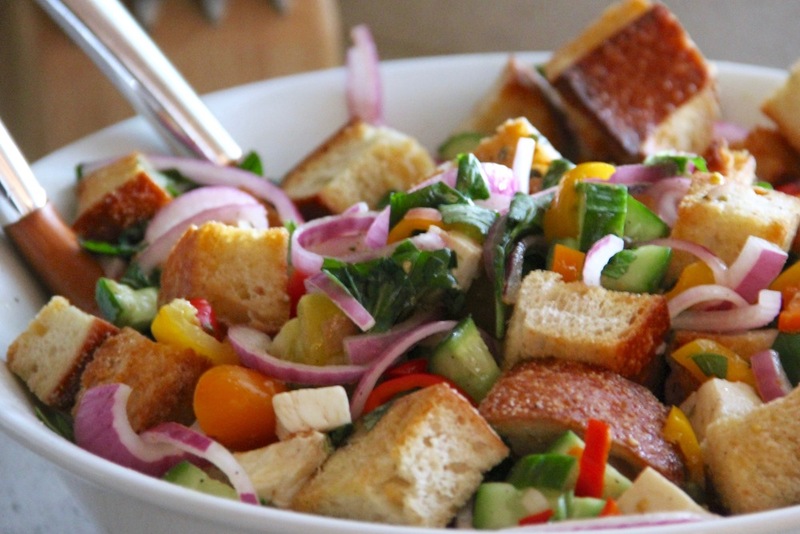 All I can say is that it was time well spent, because I came across the most fabulous collection of Panzanella Salad recipes and could not have been more excited to create my own. Add toasted bread cubes (once slightly cooled) to the vinaigrette coated veggies and slowly toss until all ingredients are sufficiently incorporated. Allow the salad to sit for at least an hour before serving so that the flavors have time to blend together. *I love serving this salad alongside freshly grilled steaks or packing this salad for a picnic with friends. I had initially planned on sharing a non-food related post with you all today. However, the featured ingredient in this recipe is only in season for a few weeks out of the year, so I wanted to make sure I left you all with some time to hunt down ramps for this recipe before the ramp season officially comes to a close. So what the heck is a ramp anyway? This is actually a piece of produce that I had only been introduced to a few weeks ago. I had a colleague at work ask me if I had ever tried a ramp before. Ramp? Like a railing? No no no, a ramp is a member of the onion family (think scallion meets chive and then hugs a leek). Essentially, it's a much milder onion and for some reason, they only have an in-season period of 2-3 weeks. Today's recipe makes for a fabulous cocktail party nibble and/or served as a casual appetizer for outdoor entertaining. 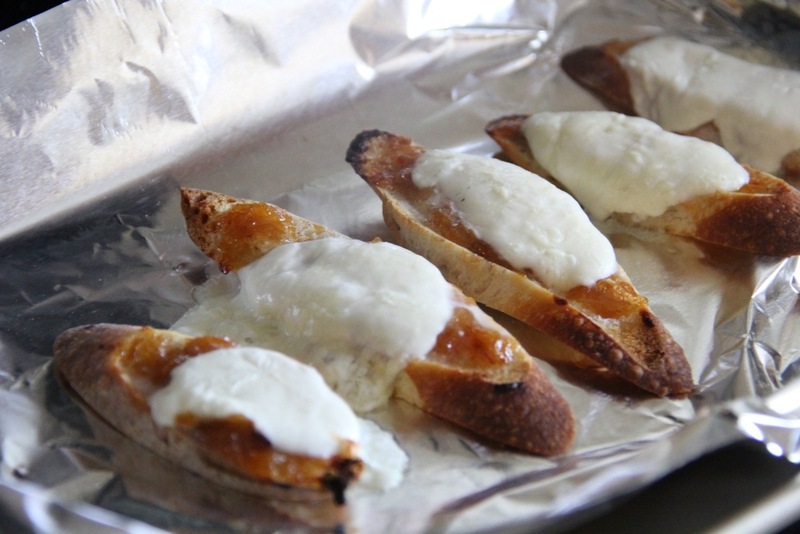 The sweetness of the peach and habanero preserve balance out the savory found in the mozzarella and ramps perfectly. There are a few components to this recipe, but I promise that it is all super easy to make and you will LOVE the end product. I have been itching to test out an unusual idea that came to me a while back and this past Sunday (thanks to National Chocolate Chip Day) I finally had my golden opportunity. Everyone talks about all of the crazy things you can cook in a waffle iron (ex. cinnamon rolls, french toast, grilled cheese, etc...) so my thought was, why not cookie dough?! It seemed like a concept that would definitely work, and who doesn't love a crispy chocolate chip cookie every once in a while? After a few rounds of trial and error, I finally figured out how to successfully waffle chocolate chip cookie dough (which of course had me jumping for joy!). To take these delicious cookies to the next level, I decided to sandwich them with a scoop of my new favorite coconut sorbet and then finish them with a little toasted coconut. The result? A dangerously delicious and highly addictive dessert that I can't seem to get enough of! These ice cream sandwiches are not only great to make for an impromptu single serving sweet treat, they also make for a fabulous summer party dessert idea. You can customize the flavor pairings to fit your palette and who doesn't love a cool treat on a hot summer day? Below are the details for making these most delicious ice cream sandwiches. Apply a small scoop of cookie dough to each quadrant (I like to use this cookie scoop) and then close the iron so that the cookies can bake. Once cookies are cooled completely, add a scoop of coconut sorbet or gelato and sandwich between a second waffled cookie. Press the toasted coconut flakes into the exposed sorbet/gelato and then return sandwich to the freezer until you are ready to serve them. I have a fellow foodie friend at work, who I absolutely adore "talking shop" with and sharing recipe ideas. We tell each other about different restaurants, cocktails and recipes we try, as well as share tips on cooking, baking, etc. It really is so much fun having someone in the office who shares the same interest and I can learn from while taking that much needed mental break from staring at my computer for hours on end! Last week during one of our chats, she mentioned this most delicious mimosa she had enjoyed at this fabulous farm to table restaurant in Baltimore, Woodberry Kitchen. Totally intrigued by the idea of making a watermelon mimosa, I decided to give it try over the weekend. Let me just say, it is an absolutely delicious cocktail idea! Naturally I felt compelled to share it with you all today. I know I have posted quite a few cocktail recipes lately and I promise that I will ease up on my cocktail posts for a while, but this mimosa recipe just had to be shared. Worthy of any brunch or summer picnic, watermelon mimosas are beyond fab!